All scores are claimed scores unless otherwise noted. 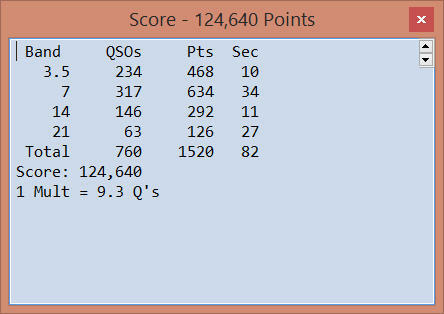 January: NAQP CW (Final Score) • QSO’s: 435 • Mult’s: 153 • Score: 66,555 • Op Time: 6 Hrs Comment: Team SMC Icicle. Bands were in good condition and activity was high. Unable to make a full time effort, however. January: NAQP SSB (Final Score) • QSO’s: 148 • Mult’s: 78 • Score: 11,544 • Op Time: 3.5 Hrs Comment: Also made 90 QSO’s, 51 Mult’s, 4,590 using W9LDX call to boost SMC score for the NAQP Challenge. January: CQ 160 CW • QSO’s: 359 • Points: 808 • Mult’s: 54 • Score: 43,632 • Op Time: 7:37 Comment: DX mults included 2 new countries on 160M. This score would have been good for first place Indiana low power in 2014. February: WPX RTTY • QSO’s: 187 • Points: 638 • WPX: 144 • Score: 91,872 • Op Time: 7:41 Comment: A 40M single band effort. DX QSO’s included one new country on 40M RTTY. This score will put me in the also ran category but, due to other commitments, I missed all of Friday night operating and most of Saturday night, so I was pleased to have been able to do as well as I did. February: ARRL DX CW • QSO’s: 55 Comment: Used packet to discover and work new band slots for DX Challenge, especially on 80M. Logged 40 new countries on 80M and 2 ATNO’s on other bands. Logged with DXLab instead of N1MM so no score calculation is available. February: NAQP RTTY (Final Score) • QSO’s: 763 • Mult’s: 168 • Score: 128,184 • Op Time: 10:00 Comment: First place for Indiana stations. A fulltime effort, resulting in a personal best score for this event and 15th overall, but at least one other 9-land station had a higher score. Eleven of the mults were DX, which was also a record. Part of team Star Trek: Live Long and Prosper with N9CK, K9CT, K9NR and WT9U which took third place in the team competition. March: WIQP • QSO’s: 56 • Points: 91 • Mult’s: 29 • Score: 2,457 • Op Time: 1:30 Comment: A considerably smaller effort than I have made in recent years. As always, the Wisconsin stations, expecially the mobiles, do an excellent job. April: FLQP • QSO’s: 189 • Points: 696 • Mult’s: 87 • Score: 60,552 • Op Time: 11:30 Comment: Made a clean sweep of all 67 Florida counties. The mobiles in this contest do an excellent job of being predictable by operating within the mobile window and staying on the same frequency. Made it easy to find them and work them as they entered new counties. Contest organizers also published the mobile schedules in advance. Thus, as I got close to the sweep, I was able to see what mobiles I should listen for in order to work my remaining counties. May: INQP (Final Score) • QSO’s: 415 • Points: 736 • Mult’s: 114 • Score: 83,904 • Op Time: 12:00 Comment: Operated mobile in the amiable company of Andy, K9ELF. In 2014 we plotted a route that carefully followed county lines in order to double our effective QSO rate, maximizing our score and winning the mobile category. This year, we plotted a route that maximized the number of counties we would visit to help ensure that all 92 Indiana counties had coverage, so our score was considerably lower. We ended up visiting 21 counties and driving a total of 520 miles. Yikes! May: 7QP (Final Score) • QSO’s: 52 • Mult’s: 33 • Score: 4,521 • Op Time: 12:00 Comment: Operated concurrently with the INQP. This score took first place in the Non-7 Mobile Multi-single Low Mixed. Of course, it was the only entry in that category . . . . . . . May: Volta RTTY (Final Score) • QSO’s: 50 • Points: 627 • DXCC: 22 • Areas: 14 • Score: 1,128,600 • Op Time: 2:00 Comment: First time operating in this contest. Was not familiar with the scoring so was surprised to see I ended up with over a million points despite making only 51 QSO’s. Saw lots of DX spotted on packet that could not be heard, which was frustrating. Final score was good for 291st place in the SO category. May: CWOps CWT 1300Z May 13 • QSO’s: 38 • Mult’s: 33 • Score: 1,254 • Op Time: 40 minutes Comment: First time operating in this 1 hour event. A friendly CW contest. No log submitted, you just post your score on 3830. A number of ops took the time to say “Welcome,” correctly understanding that I was not a CWOps member because I didn’t have a CWOps member number. May: CWOps CWT 1300Z May 20 • QSO’s: 53 • Mult’s: 45 • Score: 2,385 • Op Time: 50 minutes Comment: Used the event to test a couple of different AGC settings on the K3. So far, the default settings for slope and threshold sound the best. June: CWOps CWT 1300Z June 3 • QSO’s: 70 • Mult’s: 56 • Score: 3,920 • Op Time: 60 minutes Comment: Used the event to test my newest toy, an LP- Pan 2 with NaP3 software. Gives a much more detailed, higher resolution view of band activity than the Elecraft P3, you can interface with CW Skimmer to show spots for stations you can hear locally, and you can use your mouse to interact with the spectrum and control the radio. Here’s a screenshot taken a bit later in the day, showing activity on 40M. June: CWOps CWT 1300Z June 10 • QSO’s: 54 • Mult’s: 48 • Score: 2,592 • Op Time: 60 minutes Comment: My first CWOps CWT with my new member number: 1462. General concensus as folks posted their results to 3830 was that band conditions were crappy. June: CWOps CWT 1900Z June 10 • QSO’s: 49 • Mult’s: 46 • Score: 2,254 • Op Time: 60 minutes Comment: My first time operating in the 1900Z event. See the above comments about crappy band conditions. June: CWOps CWT 1300Z June 17 • QSO’s: 83 • Mult’s: 63 • Score: 5,229 • Op Time: 60 minutes Comment: Bands were smokin’ hot! One radio only. June: CWOps CWT 1900Z June 17 • QSO’s: 69 • Mult’s: 60 • Score: 4,140 • Op Time: 60 minutes Comment: Bands had cooled off a bit since the 1300Z session. 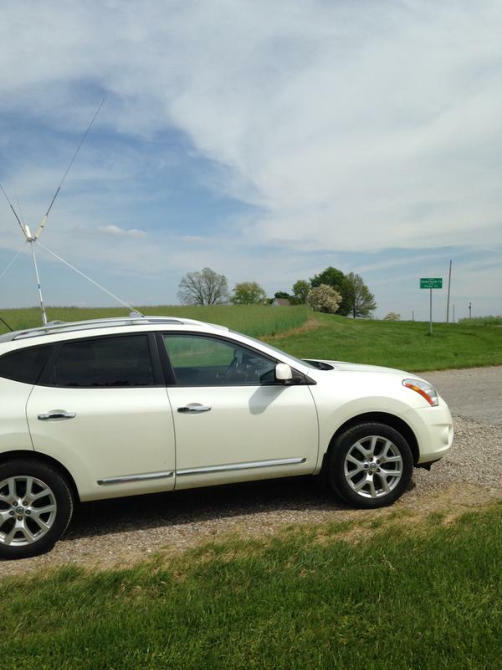 June: CWOps CWT 1900Z June 24 • QSO’s: 55 • Mult’s: 46 • Score: 2,530 • Op Time: 60 minutes June: Field Day at W9LDX 2A IN • QSO’s: 2,920 • QSO Points: 8,726 • Bonus Points: 1,050 • Score: 9,776 Comment: Our most productive 2A effort ever and well above the 9,080 score we had for our 2012 2A entry, which won 1st place in the ARRL Central Division and first place Indiana for 2A stations. The 2015 score was good for 9th place overall along with 1st place Central Division and Indiana. Operators included K8DXB, K9ELF, K9FN, K9WX, KF9UP, N9FN, N9GKE, N9KT, N9LJX and W9TN. Best rates: Phone, 124, KF9UP; CW, 94, N9LJX. July: RAC Canada Day (Final Score) • QSO’s: 181 • QSO Points: 1,216 • Mult’s: 13 • Score: 15,808 • Op Time: 6 Hrs Comment: First Place World! My typical 40M effort, but the most QSO’s, most QSO points and most mult’s ever. Spent more time calling CQ than usual. . July: CWOps CWT 1300Z July 8 • QSO’s: 76 • Mult’s: 65 • Score: 4,940 • Op Time: 60 minutes July: CWOps CWT 1900Z July 8 • QSO’s: 78 • Mult’s: 70 • Score: 5,460 • Op Time: 60 minutes Comment: Made 5 QSO’s on the second radio. July: IARU HF Championship (Final Score) • QSO’s: 520 • QSO Points: 1,206 • Mult’s: 95 • Score: 114,570 • Op Time: 10:14 Comment: First place Indiana, Fifth Place for US/VE stations in the single op, mixed, low power category! Thank goodness this contest has a simple exchange and the logging software gives you a prefill. I would hate to operate something like Sweepstakes under such horrid band conditions. There was typically only one band usable at a time (20M or 40M) so only made 67 QSO’s on the second radio. Could not get the 160M antenna to tune so missed out on a few mults there. July: CWOps CWT 1900Z July 15 • QSO’s: 79 • Mult’s: 64 • Score: 5,056 • Op Time: 60 minutes Comment: Made 5 QSO’s on 15M. July: CWOps CWT 1300Z July 22 • QSO’s: 80 • Mult’s: 65 • Score: 5,200 • Op Time: 60 minutes Comment: 40M started off with a bang. Lots of activity and good band conditions. I had 45 contacts there after just 25 minutes and the rate meter was near 200. At that point 40 was played out, so I switched to 20M, expecting the same. Very few signals and not loud, either. What a let down. July: CWOps CWT 1300Z July 29 • QSO’s: 76 • Mult’s: 62 • Score: 4,712 • Op Time: 60 minutes Comment: 40M started off with a bang. Lots of activity and good band conditions. I had 45 contacts there after just 25 minutes and the rate meter was near 200. At that point 40 was played out, so I switched to 20M, expecting the same. Very few signals and not loud, either. What a let down. August: CWOps CWT 1300Z August 5 • QSO’s: 89 • Mult’s: 79 • Score: 7,031 • Op Time: 60 minutes Comment: My best score ever, but still not quite good enough to break into the Top 10 - 13th place, to be exact. August: NAQP CW • QSO’s: 559 • Mult’s: 163 • Score: 91,117 • Op Time: 6:49 Comment: Low QRN and high activty made for a good contest. At one point the N1MM+ 10-QSO Rate Meter was over 200 while calling CQ on 40M early in the evening. To paraphrase Nathan Hale: I regret that I had but 6:49 to give to my contest. Part of SMC Team Farad. August: CWOps CWT 1300Z August 12 • QSO’s: 96 • Mult’s: 75 • Score: 7,200 • Op Time: 60 minutes Comment: Tried a different approach with this event. Typically you start out on 40M and the rates are pretty good, too good to try to do much with the second radio. Then you move up to 20M where the rates aren’t quite as good because the band is not really open yet in the midwest. So, this time around, I called CQ on the second radio on 40M after I moved to 20M on the first radio. Made a grand total of 4 QSO’s on the second radio, 2 of which were dupes. Probably would not call that a big success. Also also stayed longer on 40M at the start of the contest as rates were very good there. Finally managed to break the 90 QSO barrier, but still not in the Top Ten. August: CWOps CWT 1900Z August 12 • QSO’s: 60 • Mult’s: 54 • Score: 3,240 • Op Time: 60 minutes Comment: The 1900Z sessions are never as productive for me as the 1300Z sessions. August: NAQP SSB • QSO’s: 160 • Mult’s: 82 • Score: 13,120 • Op Time: 3:50 Comment: Bands were majorly stinky which seemed to drive down activity. I had planned to spend more time operating but it’s not much fun when you can hear ‘em but can’t work ‘em or can’t hear them at all. August: CWOps CWT 1300Z August 19 • QSO’s: 76 • Mult’s: 61 • Score: 4,636 • Op Time: 60 minutes Comment: There just weren’t many signals on 20M after 40M had played out. August: SCC RTTY Championship • QSO’s: 145 • Points: 311 • Mult’s: 93 • Score: 28,923 • Op Time: 8:26 Comment: My best score ever in this contest, although I last operated it in 2006. 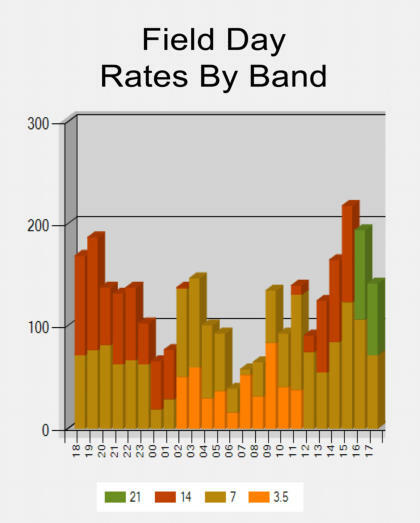 Band conditions continued the recent trend of being poor, with no 10M QSO’s and only 2 15M QSO’s. N1MM said I operated nearly 8.5 hours but that significantaly overstates the BIC time. September: CWOps CWT 1900Z September 16 • QSO’s: 67 • Mult’s: 64 • Score: 4,288 • Op Time: 60 minutes September: NA RTTY Sprint • QSO’s: 19 • Mult’s: 13 • Score: 247 • Op Time: 30 minutes Comment: A good reminder of why I don’t like the Sprint format. September: CQ WW RTTY @ K9CT • QSO’s: 4,192 • Mult’s: 699 • Score: 6,574794 Comment: First place USA but only 6th place World. Ops included AI9T, K3WA, K9CT, K9WX, N4RR, N5AC and N7US. 10M was non-existent and 15M was not much better on the first day, but was really hot on the second day. September: CWOps CWT 1300Z September 30 • QSO’s: 89 • Mult’s: 68 • Score: 6,052 • Op Time: 60 minutes October: ILQP (Final Score) • QSO’s: 202 • Points: 332 • Mult’s: 92 • Score: 30,544 • Op Time: 6:57 Comment: First Place non-Illinois stations! I’ve picked out the spot on the wall for the plaque. More mults than last year but fewer QSO’s. Not sure what that means, perhaps activity was down or band conditions were not favorable. There were 4 mobiles operating throughout the contest and all 4 had published their routes in advance. I mapped their route on an Illinois county map and was able to follow them pretty consistently throughout the contest. Towards the end of the contest, I had worked just about everybody on 40M and 80M so my activity was reduced to listening for the mobiles to change counties and then working them again from the new county. This may account for the improved multiplier total. October: CWOps CWT 1900Z October 28 • QSO’s: 80 • Mult’s: 65 • Score: 5,200 • Op Time: 60 minutes Comment: Wasted some time at the start looking for signals on 10M after hearing that it was open. Nada. It also took a while for 15M to heat up. After that, rates were good, producing my best score for a 1900Z event. November: CWOps CWT 1300Z November 4 • QSO’s: 81 • Mult’s: 66 • Score: 5,346 • Op Time: 60 minutes Comment: Made 5 QSO’s on 80M, first time ever for this band in the 1300Z event. As usual, 40M was great but only very few signals heard on 20M. Some of them were extremely weak and it took a while to pull them out, which hurts rate. November: Sweepstakes CW (Final Score) • QSO’s: 736 • Mult’s: 81 • Score: 119,232 • Op Time: 17.5 Hours Comment: First place, Indiana, low power. My record for most SS QSO’s. Had some great runs on 40M and 80M, and probably my best SS for calling CQ. Saw a couple of NT stations posted but either never heard them or they were at ESP levels. Later learned that a number of 9-land stations had an NT call in while the 9-lander was running on 20M, so I probably should have spend more time running there, or maybe 15M. November: Sweepstakes SSB Mobile (Final Score) • QSO’s: 207 • Mult’s: 78 • Score: 32,292 • Op Time: 6 Hours Comment: Low power mobile Phone is NOT the best way to operate Sweepstakes. But, SS SSB weekend found me away from home. My lovely XYL, Kathleen, agreed to drive while we returned from Iowa on Sunday. 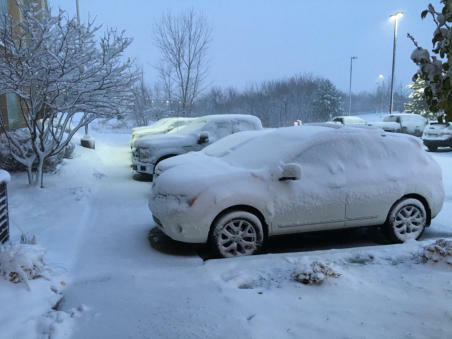 However, Saturday morning saw a near-blizzard in Eastern Iowa and we became concerned about being able to drive back at all, not to mention that the antenna mount on the top of my car was totally iced in. But, the storm broke about noon on Saturday and by Sunday enough ice and snow had melted off the top of the car to allow me to install the antenna. Under these circumstances I figured the probability of a Sweep was zero. Then I easily worked the NT section at 1900z Sunday afternoon and I thought, uh oh, now I have to start worrying about a Sweep. But, the pileups were big for a couple of the other rare sections and there were another few I never heard at all. So, the excitement died down and I was able to relax and enjoy what I had. Even though I made contacts from 3 different states, I always gave out IN as my section: the League’s SS rules don’t seem to cover mobile operations very well, at least when it comes to what section you give out as you cross state lines. Photo: Davenport, Iowa midway during the storm. November: CWOps CWT 1300Z November 25 • QSO’s: 94 • Mult’s: 78 • Score: 7,332 • Op Time: 60 minutes Comment: My highest point total ever and my first top ten finish, at least per 3830 at 2 hours after the end of the contest. Not my highest QSO total, however: made 96 QSO’s for an August 1300z event. December: CWOps CWT 1300Z December 9 • QSO’s: 97 • Mult’s: 88 • Score: 8,536 • Op Time: 60 minutes Comment: My highest point total ever, my highest QSO total ever, and a top ten finish per 3830 (7th place), at least as of 30 minutes past the end of the contest. One of the rare times in a CWOps contest that using the second radio was a positive. December: CWOps CWT 1300Z December 23 • QSO’s: 100 • Mult’s: 77 • Score: 7,700 • Op Time: 60 minutes Comment: My highest QSO total ever, and a top ten finish per 3830 (8th place), at least as of 30 minutes past the end of the contest. All QSO’s made on a single radio. December: Stew Perry • QSO’s: 188 • Score: 569 • Op Time: 4:50 Comment: Thunderstorms and heavy rain in December. Made operating very challenging. Never the less, this was my highest QSO total ever in the Stew Perry. When there is that much noise on a band, you typically QSY to a different band. Can’t do that in a single band contest. K9ELF Photo: On the Posey/Vanderburgh county line near the midway point of the INQP.